​While I expect to continue Yours in a Hurry stories about Anna, Purl, Addison, and Ida, today I want to take you to where my thoughts have lain and share the story of a little-known historical Ohio Appalachian area: The Little Cities of the Black Diamonds. It’s where my father was born and raised and to which he felt forever bound. He and his family left in the late 1930’s when much of the work finally dried up. I learned a lot while researching America’s Appalachia. The northern part is culturally different in many ways from the south, forcing me to revise many stereotypes. If you're interested in reading about this yourself, find a copy of The Encyclopedia of Appalachia (Rudy Abramson and Jean Haskell, 2006). It's helping me write fiction based on my father's oral history and photos. ​Shortly after my mother passed away, the first thing my father asked me to do was take a several-day trip so he could visit every small-town hollow where he’d lived growing up. I’d never seen most of them as my mother, from a small town in mid-Ohio, felt no connection to the area. My then fourteen-year-old son and I watched with trepidation as he would get out of the car at various farm houses, knock on the door, and if someone answered, asked, “Have you lived here long?” If the answer was yes, he’d ask if they remembered his family. One man remembered that dad had worked for his father on the farm during summers when he was in junior high. ​Another time we parked across the highway from a house dad remembered. As he looked across the highway he smiled and said, “Look at that; (I can’t recall the name) doesn’t look that different after sixty years except for the beard.” The man looked like Santa Claus, about as round as he was tall in a T-shirt covered by suspender overalls. As I’d expected, Mike and I sat in the car about half an hour as the two old friends traded stories. Dad took to this discussion an old photo of a pretty teenage girl he'd brought with him (possibly an early love?). He never told us who was in the photo. ​The most memorable visit was to Mrs. Parsons’ home in Athens. Dad was fortunate enough to graduate from an early auto mechanics class at Chancy Dover in the late 1930’s. That served him well during World War 2 and throughout life. But it really helped him during the Depression when the Parsons asked him to manage a gas station they owned at a unique location: the ‘Y’ at the intersection of state routes 33 and 50 in southeast Ohio. Given the few good roads at the time and the station's location at a main thoroughfare in southeast Ohio, including Columbus and West Virginia, it was a good business. He remembered an Ohio Governor stopping once. ​During dad’s employment it became Shell Oil. ​Dad always spoke of the Parsons with deep respect. Meticulously dressed, they were part of Athens society. One of his fondest memories was when they arranged dates with two of their visiting nieces who attended college for dad and a friend of his. Pretty heady stuff for guys in an area where high school was considered an accomplishment. In the early 1950’s, the Parsons visited mom and dad in Akron. Mr. Parsons was on a business trip, buying up property throughout Ohio for the new interstate highways. In 1994, Mr. Parsons was gone. Dad made sure to put on a good shirt the morning the three of us were to visit Mrs. Parsons. The décor of her home reminded me of the Eisenhower farm in Gettysburg—a 1950’s feel. We sat in the back screened-in porch. Mrs. Parsons looked to be in her late 80’s but was still very bright and gracious. She surprisingly brought cookies and lemonade to us on a silver service—a first for Mike. ​The trip was a unique experience to share with dad. He evidently knew it would be the last time he’d see these people who’d meant so much to him. I’ve made other visits to the Little Cities with professional groups and with my children. I’m fascinated with the area and the history of the once over fifty towns or crossroads that became the Little Cities. Few now live outside the bigger towns like Athens or Nelsonville, but some towns like Shawnee still work to maintain and preserve the structures and history of the boom years—among them Murray City, Glouster, Chauncey, New Straitsville, Buchtel…all have interesting histories. I’ll share some with you. Ann Otto writes fiction based on factual as well as oral history. Her debut novel, Yours in a Hurry, about Ohioans relocating to California in the 1910’s, is available on-line at Amazon, Barnes & Noble, Kindle, and at locations listed on her website at www.ann-otto.com. Ann’s academic background is in history, English, and behavioral science, and she has published in academic and professional journals. She enjoys speaking with groups about all things history, writing, and the events, locations, and characters from Yours in a Hurry. She is currently working on her next novel about Ohio’s Appalachia in the 1920’s and prepared for future works by blogging about a recent World War 2 European tour. She can be reached through the website, or on Facebook @Annottoauthor or www.Goodreads.com. ​I just returned from my first visit to Japan. It’s been 110 years since my grandfather Thomas Purl Hartle served in the Pacific with the army. The life-long devotee to Teddy Roosevelt helped build harbors in Corregidor, the Philippines, and Hawaii and visited Yokohama and Tokyo in Japan. ​Interesting photos in the Edo-Tokyo Museum showed crowded 1910 streets that he’d walked. It’s hard to imagine that he’d had these experiences and then went home to small towns in Ohio that he never left again except for a couple of visits to his sister Anna in San Antonio, Texas. ​Here’s an excerpt from Purl’s travels in the Philippines from Yours in a Hurry. ​ Purl guessed right. The topographical survey in some ways wasn't a lucky assignment. Transport was difficult and uncomfortable. Ponies and caribou couldn't be used through mountains, jungle, and across ravines, so a contingent of native porters pulled large boxes containing their equipment and provisions. One night an officer found an abandoned shack with some supplies. Purl and the other soldiers sat and rested after the day's march. Purl decided to take out his pen and share some experiences with Anna. I was selected to assist in documenting our survey, so thought I would describe our experiences for you to share. Our party is divided into three sections, each with one commissioned officer, eight enlisted men, and four porters. We are provided provisions for two weeks, the time needed to complete the survey of our assigned territory. We went to the province of Bulacan. The route is through many barrios. Due to the heat, we bivouacked under roof instead of on the ground when possible. We once slept in an old native house of worship in Buena Vista and woke to church bells and chants by native Tagalogs who are now Catholic. We left through the Marquina Valley—large forests of bamboo, ebony, and bush-like trees filled with tropical fruits and vegetables, and a strong cinnamon smell. I can see why Spain fought so hard to keep this land. In the dense forest of the San Madre Mountains, we saw many monkeys and parrots and stopped to trade for food. I wish you could have seen the Albinos in northern Luzon—an entire colony who inherit the trait. They are shy and shield themselves from the sun with a fan of palm leaf. We passed a village of Igorrote head hunters—a wild tribe of the North who eat dog and grasshopper pies. As we begin our last few days, cholera and smallpox are reported throughout Luzon. It is against the law to drink un-boiled water, and we follow the rule as best we can out here. Much more to tell, but Robbie says that we need to fix camp as a storm may be coming. After finishing his letter, Purl walked out to where Robbie was standing. "Sarge says it may be a typhoon," Robbie said. "He hasn't been through one before, but some of the other men have." Purl squinted upward and assessed the darkening sky. "I'll give it at least an hour before we know for sure. I best be getting a shave in. It could be a long day or two." "You are the only man I know who can't be with a bristle of hair on your face!" "It's the light complexion—looks poorly with hair." The troops did what they could to make a meal of the brown and somewhat mushy produce they found in the shack by combining it with their tins of meat. Purl had just finished eating and stretched out on his blanket on the floor when a loud wind whistled through the palms. The shack trembled as though it would fall down around him. Purl heard thunder from far away. Flashes of lightening hit the ground as the storm approached. Each flash lit the dark room, and he could see Robbie cringing on the floor nearby. "That one was close. I don't remember storms this fierce in West Virginia!" Robbie said. After another loud clap of thunder the wind caused the palms to sway more erratically. "If this is a typhoon, you can be sure it's nothing like back home." The maelstrom continued until daylight. When they awoke, empty sacks of chewing tobacco lay scattered on the shack floor. "A lot were sure scared!" Robbie said, assessing the debris. "I went through one of those pouches myself." Purl replied. "When I wasn't worried, I was bored—couldn't sleep." They pieced together a quick breakfast of bread and fruit. The lieutenant came into the shack, wet and with muddy boots. "I don't think the rain is going to stop. We may as well get going. Pack up." The rain continued until midafternoon. They stepped carefully across the desolated landscape through deep gullies worn in the soil, avoiding flooded streams. Purl, one of the tallest, often had to stoop to avoid drooping palms. Then the sun began to blaze. Starting down the trail, they passed a Filipino carrying a load of sugar cane. Robbie said, "I'm going to go ask that native about the shack we stayed in last night. I still don't understand why it was vacant with all those supplies." He motioned to the Filipino translator. "Ask that man if he knows why no one is living in the shack on the hill with all the provisions. It appears they just up and left." The translator spoke to the man, returned, and without emotion, reported to Robbie, "No one will live there. All of the family died of the cholera." Purl watched as Robbie ran to the lieutenant and with heavy breathing asked, "Do we have anything to take for the cholera? Everyone in that shack died and now we're all going to be sick!" The lieutenant replied calmly, "Don't worry, White. I think we would know by now if we were contaminated. There's no delay in the action of that germ." One of the men standing next to Purl had eaten a significant amount of fruit in the shack. He turned pale, sat on the ground, put his head in his hands, and said, "We're all going to die!" The young lieutenant shook his head and helped the man up. "Come on, soldier, let's pick up the pace and get back to camp." They returned the next day. "It's good to be back at headquarters." Robbie said. "Good food, showers, cards, and music. Who could ask for more? And no one died of the cholera!" he added with mock seriousness. Purl chuckled, thinking of the anxiety some of them showed on the trail. "No, but some were near scared to death.” He was quiet for a moment. "A visit home sure wouldn't be bad. I'd like to see my family. And until we leave Manila, construction on the Corregidor emplacements will be harder work." Robbie yawned. "Well, right now I'm going to fall into bed." "See you in the morning." ​Anna Hartle had ups and downs in my novel Yours in a Hurry just as she did in real life. She went on to a second marriage in San Antonio, which is where the novel left off, and I may continue her intriguing story someday. Both she and her cousin, Daeida ‘Ida’ Hartell Wilcox Beveridge, a reader favorite in the novel, were strong women. Ida especially accomplished much in her life as the founder and promoter of Hollywood, California in the 1880's until her death in 1914. Here’s an excerpt from the novel. Both women are in real estate, and Anna, being new in town, is getting a tour of Los Angeles from Ida before lunching at the Hollywood Hotel. Ida and her driver picked Anna up the next morning. "We'll see the best architecture in the city—the classical French style Beaux Arts Farmers and Merchants Bank at 4th Street and Main and the Italianate Merced Theater on Olvera Street downtown with its towers and arches. You must see the colorful 'Painted Lady' Victorian houses in Angelino Heights, and the Mission Revival-style Powers House, the centerpiece for the Alvarado Terrace subdivision south of downtown in which Joseph takes such great interest. "Aren't you glad you chose a bungalow, Anna?" Ida continued. "It's Frank Lloyd Wright's influence—such a wonderful blend of Oriental and the simple Arts and Crafts. It's a common dwelling in India, the Bangala, as the British call it. Wright is one of my favorite architects." She tilted her head closer to Anna and said in a lowered voice, "His infamous marital problems aside." "I like that they're very affordable and private," Anna replied. "Owning a plot of land, no matter how small, seems to give a feeling of independence." Her smile faded as she saw the tops of oil wells beyond. "The landscape certainly is changing in other ways." Ida frowned. "Yes, they say it's good for the economy, but since Edward Doheny made the first strike back in '92, many oil derricks have gone up a few blocks west of downtown, and the whole northwest side is a forest of them." "It's a wonder the neighbors can stand the smell of the oil and all of the 'black rain,'" Anna said, sniffing the air. "They can't. The companies pay them sufficient royalties for their property so they can relocate. The oil wells will soon threaten Beverly Hills." Anna gazed in store windows as they passed. "There are so many electric signs." "The first one was on a livery stable on the south side of Sunset near Wilcox Avenue." "The street named for you and Harvey?" Anna teased. Ida acknowledged the comment with a smile, and then said, "I think it's time to stop for lunch." They arrived at the Hollywood Hotel and were immediately led to a table. "This is my favorite place to lunch," Ida said. Anna could see why. Small, round white-clothed covered tables filled the room. Ferns hung from the ceiling along with round, globed chandeliers. Rather modern, she thought. Windows at two levels, some showing the street, and smaller ones near the ceiling disseminated light throughout the rooms. A fresh flower bouquet adorned each table. Mira Hershey approached their table shortly after they were seated. "Mira is the owner—chocolate money from back East," Ida whispered to Anna. Mira smiled broadly when she arrived at the table. "So glad to see you, Ida." Ida nodded toward Anna. "This is my cousin, Anna Hartle. She's new in town, working with Joseph Cowell in his real estate business. I'm showing her around the area today." "It is a pleasure to meet you, Anna. You couldn't ask for a better guide. I hope you both can return for tea another time." "Certainly," Ida replied. Turning to Anna, she said, "Every afternoon Mira serves high tea in the lobby. And, the real treat is on Sundays when she performs a piano concert in the rotunda. Her Bach is to behold!" Mira blushed and replied, "It was nice meeting you, Anna. Enjoy your lunch, ladies." She turned, nodded to someone at another table, and started in that direction. Anna perused the room again. "We certainly have nothing like this back home." Ida sighed, "Yes, but it has suffered in the general business slowdown. Many are worried about too much competition among the new suburbs growing in all directions around Los Angeles." She took a sip of tea and changed the subject. "Did you see the list of new city ordinances in today's newspaper?" "Yes, quite a list," Anna replied. "You can tell most of us are Midwesterners. The sale of liquor and most gambling is prohibited. I don't know how much longer we will be able to control alcohol with all the business coming to town." She moved closer to Anna and whispered, "Even Philo has been known to put white wine in water glasses when we entertain." "Is the one limiting the number of livestock permitted through the streets really necessary? I've never seen anything like that." "Well, it was not that many years ago that sheep and cattle ranches were on this spot, and even I can remember seeing cattle herded down a city street. I understand smaller livestock were brought through by the thousands, not always under competent control." Anna couldn't imagine seeing two hundred cattle herded down her street. She gazed over the verdant foothills and rugged mountains. A refreshingly cool breeze, scented from the salty ocean a mile away, blew in through an open window in the restaurant. "No wonder people want to live here. There is so much to do. One can use bicycles, automobiles, or the railroad trains to sightsee, and the electric railroad takes you to any beach for fifty cents." "Yes," Ida responded, "everything thrives, but none of us, not even the plants, are native. The palm trees come from Mexico and the Eucalyptus from Australia." ​Anna opened her timepiece. "I must be getting back. I promised Joseph that I would inform him about a client call yet this afternoon. And, I need to write some letters, especially one to Addison." ​Before beginning posts about my new work in progress, I wanted to reflect on the four main characters from Yours in a Hurry, all members of the Hartle clan. They are actual historical characters, but some of their experiences were fictionalized for the book. I need to start with Addison. The newspaper articles my family kept about his life in Los Angeles started the research that led to other characters and to other plot directions. Dominguez Hills was nearly fourteen miles due south from the plaza in the center of Los Angeles, and it sloped upward to the west. Addison, the Beveridges, Joseph, and Anna took the same railroad route as Addison had the previous day. The women wore what the newspapers were featuring as "ladies wear" for the air show, an ankle-length pleated skirt—including pebbles sewn in the hem—high-collared blouse, and a long coat for the wind, which was to be expected atop a plateau like Dominguez Hills. The coat had the added benefit of covering Anna's condition. "Thank you for getting us here, Addison," Ida said as they made their way through the crowds. "But we must find a more suitable way home. I feel absolutely claustrophobic.” She turned to Philo. "Unfortunate isn't it, dear, that none of our land was suitable for the event. I would have loved to provide some." Joseph smiled as Philo replied, "Yes, what publicity that would have afforded Beveridge and Beveridge!" ​ Twenty-five thousand sat in bleachers as thousands more milled around the field watching imported monoplanes and biplanes compete with domestic machines. The hawkers included Fatima, The Sultan's Delight, and the Siamese twins Cora-Etta. The men tittered as Anna and Ida diverted their glance and giggled. Addison glanced at his timepiece and then in the direction of Curtiss's tent." This is where we are supposed to meet Ernie." Joseph waved as a tall, well-dressed woman approached them. White lace parasols protected her and her companion from the sun. "Good to see you, Joseph," she said. Addison stared. It couldn't be the Harriet Quimby. Joseph reached for her hand. "How are your parents, Harriet?" Joseph turned to the others. "Meet Miss Harriet Quimby. I know her parents who live in San Francisco. She . . ."
Anna stepped forward before Joseph could finish and took Harriet's hand. "I'm Joseph's associate, Anna Hartle. I'm honored to meet you, Miss Quimby. I read all of your articles in Leslie's." "See, Harriet? Your reputation precedes you!" Ida extended her hand. "Miss Quimby, I'm also an admirer—Ida Beveridge, and this is my husband, Philo." "Of course, Mrs. Beveridge, I've seen your photograph. What changes you have made in the city. I remember reading about you and Mr. Wilcox when I worked in San Francisco years ago. I believe we have an acquaintance in common, David Griffith. He and his wife Linda are long time colleagues of mine." "Yes, since he has started filming his motion pictures here, he's become acquainted with our neighbor Paul deLongpre." Ernie arrived just as Joseph introduced Addison. "This is Addison Hartle, Anna's brother," he said, turning to Addison. For once in his life, Addison was speechless as he shook Harriet's outstretched hand. Joseph turned to Ernie. "And you must be Anna's former pupil, Ernie." "Joseph! What a way to introduce Ernie," Anna said. She placed an arm on Ernie's shoulder and turned toward Harriet and Carrie. "Ernie is a mechanic for Glenn Curtiss." "Are you writing about the event, Harriet?" Joseph asked. She nodded toward the hangars. "I've been reading about these flyers and want to see them myself. I've written about local flying fields around New York." "It must be interesting working for Glenn Curtiss," Harriet said to Ernie. "Never a dull moment, especially in Europe last year," Ernie replied. "You were at Reims and Brescia? I'm envious. I've traveled much of the world, but to see aeroplane exhibitions in France and Italy would be exciting. Did you meet Louis Blériot?" "Yes, he's a crowd pleaser," Ernie quickly replied. "Can you imagine, a fellow like me coming from a crossroads town in Ohio and getting to do all that? But Addison is going to outdo me and buy an aeroplane sometime soon." Addison could tell that Ernie was reaching to impress Harriet. She said, "I'll be interested in how you progress, Mr. Hartle." His face turned a slight pink. Harriet turned to the others. "I'm hoping to write more about flying, if my editor agrees. Well, I must meet some of my journalist friends. It was wonderful meeting you all." Joseph tipped his hat. "Give my regards to your parents." "It was nice meeting you all," Carrie said. "Likewise," they all replied in near unison. Harriet opened her parasol and smiled as she strolled away. "She's real pretty, just like in her pictures," said Ernie. "I've always respected Miss Quimby," Anna reflected. "She takes on so many causes and writes about people and places that others wouldn't—tenements, immigrants, and working girls in New York. She's taken photographs all over the world." Anna gave Addison a slight shove on the shoulder. "I have never seen you blush. I thought you were incapable." Addison rolled his eyes at her. Joseph said to Anna, "You really should try to find some of her early articles from the San Francisco Chronicle where she started. Jack London and Ambrose Bierce were working there at the same time. Better stories than her more recent ones, I think." The group's attention switched to the main event. The master of ceremonies declared the meet open and introduced Glenn Curtiss as "greatest flyer in the world." Ernie flushed with pride. Soon the crowd gazed into the sky, their eyes wide and mouths open as four aeroplanes took off at once. Addison figured some were in disbelief and some in trepidation. The pilots flew in formation and then pursued each other around the field. Addison replied, "Can you imagine, most of these people have never seen an aeroplane in flight, and many held for years that it was impossible to fly." Ida said, "It reminds me of Mr. Edison's inventions. It's hard to imagine." Writing historical fiction is tricky. Most authors do a significant amount of research before putting pen to paper. Then we determine what pieces of history are worthy of telling in an interesting way to our audiences. When I’d finished Yours in a Hurry, I was faced with how to let my readers know what was historical and what was fiction. I also needed to credit authors whose nonfiction or historical fiction works contributed to my novel. I went to one of my favorite historical novel authors, Mary Doria Russell, for help. She directed me to her interesting Dreamers of the Day, for an example of how I could accommodate my readers and contributors. To help other authors, the Sources chapter used at the end of my novel is repeated below to illustrate. Many Yours in a Hurry characters are real. However, like the stories around actual historical events in the novel, many of their stories are fictionalized. For instance, there’s no proof that aviators Harriet, Matilde, and Blanche were close friends, but they did interact in their work. The benefit of writing historical fiction is the pleasure in imagining a different world—what might or could have been—and to introduce readers to certain times, places, and characters they may not have known otherwise. The following sources were most helpful. According to the May 18, 1911 Los Angeles Examiner, Anna moved to California and worked in real estate. That’s all I know until she eventually moved to San Antonio. There was a family code of silence around her life. The 1910 Census provided information on those who lived in Anna’s Los Angeles neighborhood. Names of the neighborhood characters have been changed as the stories around them are fictionalized, but not their occupations. I doubt that Anna and her actual second cousin Daeida “Ida” Wilcox Beveridge ever met, but Joseph was a good connection given Ida’s successful real estate career. The women resembled each other, and I owe much to a guide at the Hollywood Heritage Museum’s old Hollywood tour for insights into Ida’s personality. The best sources on Ida and early Hollywood are Gregory Paul Williams’s The History of Hollywood: An Illustrated History (Los Angeles, CA: BL Press, 2011) and Bruce T. Torrence’s Hollywood: The First Hundred Years (New York: New York Zoetrope, 1982). For early California culture, read Inventing the Dream: California through the Progressive Era (New York, NY: Oxford University Press, USA, 1986) by Kevin Starr. Two novels popular during the period are mentioned in several sources: Helen Hunt Jackson’s Ramona (Boston, MA: Little Brown and Company, 1884) and Howard Bell Wright’s The Winning of Barbara Worth (New York: A. L. Burt Publishing Company, 1911). Reading these works and watching the 1920’s film versions provided insight into early California. The song, ‘Meet Me Tonight in Dreamland,’ by Leo Friedman with Beth Slater Whitson, is listed on the Public Domain Information Project list, and the original Henry Burr rendition is available on YouTube. Anna actually married the Martin character. Their child, Milo, disappeared after birth. As no death certificate exits, I assumed the alternative. We know Anna and Martin divorced before May 1911. Their story is fictionalized, but he did end up in prison several years later. The comments Joseph relates from pardon letters after Martin’s capture are based on the actual file at the California State Archives at San Quentin. Addison left Marseilles, Ohio and was in St. Louis in 1910. What we know of his move and activities in Los Angeles, including his relationship with Harry Dosh, are taken from two newspaper articles, the first, mentioned above in the Los Angeles Examiner, and also the May 13, 1911 Los Angeles Express. Did he attend all of the air exhibitions described in the story? Without formal education in aviation and given that he was in some cities near the time of the events, it’s plausible. His death and George Kelly’s are reported in the June 1911 Aeronautics. The original letter to Mr. Davis was printed in Upper Sandusky, Ohio’s The Daily Chief on May 27, 1911. The aviators described at the air shows are real, but Ernie Spoon is a fictional character. The early aviation story line was developed from many sources. Three I returned to often are Tom D. Crouch’s Wings: A History of Aviation from Kites to the Space Age (New York: W.W. Norton & Company, 2003); Terry Gwynn-Jones’s The Air Racers: Aviation’s Golden Era 1909-1936 (London: Pelham Books, 1984); and Contact! : The Story of the Early Birds by Henry Serrano Villard (New York: Thomas Y. Crowell Company, 1968). The main source for Glenn Curtiss is C. R. Roseberry’s Glenn Curtiss: Pioneer of Flight (Syracuse, New York: Syracuse University Press, 1972). The Wright Brothers’ story is told in both Fred Howard’s Wilbur and Orville: A Biography of the Wright Brothers (New York: Ballantine Books, 1987) and Orville’s Aviators: Outstanding Alumni of the Wright Flying School (Jefferson, North Carolina: McFarland and Company, 2009) by John Edwards. Historical novel fans will appreciate Walter Boyne’s Dawn Over Kitty Hawk: The Novel of the Wright Brothers (New York, NY: Tom Doherty Associates, 2003). Another Ohio boy’s story that captured hearts at the time is told in Martin Kidston’s Cromwell Dixon: A Boy and His Plane (Helena Montana: Farcountry Press, 2007). ​Accounts on major air shows reflect numerous sources, including those aviation sources mentioned earlier and the following: Peter Demetz’s The Air Show at Brescia, 1909 (New York: Farrar, Straus and Giroux, 2002); Kenneth E. Pauley and the Dominguez Rancho Adobe Museum’s The 1910 Los Angeles International Air Meet (Charleston, SC: Acadia Publishing 2009); and the Century of Flight website, www.century-of-flight.net/index.htm. As for the women aviators, Harriet Quimby’s story comes from Giacinta Bradley Koontz’s The Harriet Quimby Scrapbook: The Life of America’s First Birdwoman (1875-1912) (Bend, Oregon: Maverick Publications, 2003) and Ed Y. Hall’s Harriet Quimby: America’s First Lady of the Air (Spartanburg, South Carolina: Honoribus Press, 1990). Much detail of Harriet’s flights and experiences are taken from her articles, which appeared in Leslie’s Illustrated Weekly between the years of 1909 and 1912, all of which are chronicled in Hall’s book. Copies of some articles appear in both his and Koontz’s works. Journalist Gertrude Stevenson’s story is provided by Koontz and is taken from Stevenson’s article in the Boston Herald at the time. Matilde Moisant and her brothers John and Alfred are followed in Doris Rich’s The Magnificent Moisants (Washington: Smithsonian Institution Press, 1998). For Blanche, I relied on Julie Cummins’s Tomboy of the Air (New York: Harper Collins, 2001) and websites, especially Early Aviators at www.earlyaviators.com. The Dorothy Gibson Titanic story comes from the Story of the Titanic as Told by its Survivors, edited by Jack Winocour (Mineola, NY: Dover Publications, 1960), which contains several earlier publications that provide first-hand accounts of the disaster. Purl did leave Ohio for the service after losing his inheritance. Except for discharges, records of this period were lost by the government. I was fortunate to find a firsthand account of his unit, Exploits and Adventures of a Soldier Ashore and Afloat  (Philadelphia: J.B. Lippincott Company, 1911) by William Llewellyn Adams. Additional information about the military at that time can be found in Lisle A. Rose’s Power at Sea: The Age of Navalism, 1890-1918 (Columbia, Missouri: The University of Missouri Press, 2007) and The Regulars: The American Army 1898-1941 (Cambridge, Massachusetts: Harvard University Press, 2004) by Edward M. Coffman. Will and Robbie are fictional characters. Jack London stories as edited by Steven Kasdin in The Collected Jack London (New York: Marboro Books, 1991) helped describe the Pacific settings. Joan London’s Jack London and His Times (New York: Doubleday, Doran and Co., 1939) provided insight to the period. Purl’s life-long dedication to Roosevelt led me to read more about his influence on the nation before, while, and after he was in office, especially the more recent sources such as Doris Kearns Goodwin’s The Bully Pulpit (New York: Simon and Schuster, 2013) and PhilipMcFarland’s Mark Twain and the Colonel (Lanham, MD: Rowman & Littlefield, 2012). If reading Yours in a Hurry left you wanting to read more, here are additional recommendations from the extensive list I used over the past several years. ​A recent Public Broadcasting Service telecast, Letters from Bagdad, reminds us of another woman who had a great influence during World War (WWI), Gertrude Bell. Her sphere of influence was in the Eastern Front. Her path often crossed with Englishmen T.E. Lawrence, better know as Lawrence of Arabia, and Winston Churchill. Gertrude Margaret Lowthian Bell was born in1868, and by the time of her death in 1926, she would be known among other things as an English writer, scholar, historian, archeologist, linguist, and political officer. Her mother died when she was two years old, and her father remarried six years later. In 1892 she went to live and study with a diplomatic family friend in Teheran. She loved the Arabic language, had taken up photography, and published her first book, Syria: The Desert and the Sown, in 1907. By then she was determined to remain in the East. At the start of the war, the Arabs held her as a spy for a short period in Hayyil. They refused to let her travel, took her money, and placed her in solitary confinement. She was in the middle of a raging war zone, and many historians are still of the opinion that she was a British spy. Bell’s contributions in the Middle East during WWI are considered unmatched by many. The British in Cairo knew that the Arabs would be influential to success in the Eastern Theater. Her job became gathering and sorting of information. Her cartography skills and extensive travels from 1900-1913 among the various tribes using her linguistic skills enabled her to develop the “Bell Map” used by the military throughout and after the war. She knew where certain sheiks were located, their language, and their culture. This made her highly influential to British imperial policy-making throughout Greater Syria, Mesopotamia, Asia Minor, and Arabia. Along with T. E. Lawrence, she helped support the political and hereditary leaderships in what are today Jordan and Iraq. We can see that Bell played an important role in negotiations regarding the Ottoman Empire after the war by her positioning in famous photos, always front and center. In one, she is on a camel in front of the Egyptian Sphinx between Lawrence and Churchill, also on camels. In another at the Cairo Conference in 1921, along with an entourage of military and diplomatic types. At the 1924 High Commission meeting in Baghdad, she’s seated with colleagues and Arab ministers. Always the only woman. She and Lawrence began to see that the British, who had promised the Arabs an independent state if they worked with the British, might not keep their promise after the war. They fought for the Arabs during the 1919 Peace Accords. She played a major role in establishing and helping administer the modern state of Iraq, by attempting to draw new boundary lines around the country. In 1921 she was pleased when Faisal ibn Hussain was named King of Iraq, but was later disillusioned when she was no longer sought in a policy-making role. In the mid-1920s Bell became Director of Antiquities in Baghdad, specifically to oversee the building of the Iraq Museum in Baghdad. She eventually suffered a breakdown, and her family convinced her to come home. But England was no longer home, and she returned quickly to Iraq, intent on finishing the museum. A final depression soon set in, and she died in Baghdad in 1926. But she finished her work. Her last letter home described the opening of the new Iraq Museum. If you’d like to learn more about this intriguing historical woman, Georgina Howell’s book is a good source. Sources: Gertrude Bell: Queen of the Desert, Shaper of Nations, Georgina Howell, 2006 and the links highlighted in the above text. ​Most of us know Jane Addams as the reformer who fought poverty, crime, alcoholism, and inequality from Hull House in Chicago, founded in 1889. She was also a suffragette. She and Carrie Chapman Catt, along with three-thousand others, attended a meeting in Washington D.C. in January 1915 where the Women’s Peace Party was formed. Addams was selected to chair the new party. This led to her international leadership in attempts to end the carnage of World War I (WWI). Her history of that period was reported at the time in a social reform journal, The Survey, which is included in A. Scott Berg’s World War I and America. Some of her reports follow. By mid-1915, women around the world were increasingly worried about a brutal war that seemed without end. European women delegates from twelve countries, both neutral and some involved in the conflict, desired a negotiated end to the war. The newly formed International Congress of Women in the Hague set a meeting for April 1915. They needed a spokesperson for their president, and Addams, being the farthest away and from a neutral country, was the best choice. She was charged with meeting with heads of states in Britain, Germany, Austria-Hungry, France, and Italy and some neutral countries—nine governments in five weeks. Those meetings and her reflections were included in a lecture at Carnegie Hall in New York when she returned in July. One problem was that leaders needed a more careful understanding that could only be obtained through first-hand impressions and experience, not from emotional “tall talk.” She heard the same causes and reasons for war. All reported that they were acting in self-defense. Any sign of willingness to negotiate had the potential of the enemy viewing them as weak. When meeting with heads of state, Addams asked directly, “If a proposition were presented to you, which seemed to you feasible…would you decline such a proposition? Would you feel justified to go on sacrificing the young men of your country…?” Not one was willing to commit. Addams also met with pacifists in her travels. They convinced her that the war was breaking down civil life that would be difficult to re-establish later, and that it was an old man’s war. Many young fighting men did not want the war, and she was told that many on both sides refused to shoot to kill. Some in England pointed to the Victorian influences of hate, intolerance, and revenge, and were saddened that the younger generation had just started to overcome this negative culture prior to the war. Why, she wondered, are there international bodies for science and commerce, but none for international law? She denied newspaper reports that she was advising President Woodrow Wilson. But it’s possible as his later ideas regarding a league of nations reflect her comments. The United States entered the conflict on April 6, 1917. It is ironic that President Wilson and others could not heed the advice and experience that Addams and the International Congress of Women in The Hague provided. In retrospect, maybe their work was not in vain. Perhaps they provided a model for the future. Ann Otto writes fiction based on factual as well as oral history. Her debut novel, Yours in a Hurry, about Ohioans relocating to California in the 1910’s, is available on-line at Amazon, Barnes & Noble, Kindle, and at locations listed on her website at www.ann-otto.com. Ann’s academic background is in history, English, and behavioral science, and she has published in academic and professional journals. She enjoys speaking with groups about all things history, writing, and the events, locations, and characters from Yours in a Hurry. She is currently working on her next novel about Ohio’s Appalachia in the 1920’s, and prepared for future works by blogging about a recent World War 2 European tour. She can be reached through the website, or on Facebook @Annottoauthor or www.Goodreads.com. ​One of Edith Wharton’s best-known quotes is “Life is always a tightrope or a feather bed. Give me the tightrope.” Her activities leading up to World War I certainly reflected that philosophy. Born in 1862, she was best known as a novelist and playwright who used her life experiences as part of the wealthy upper-class New York aristocracy to realistically portray the lives and morals of the Gilded Age. She’d later, in 1921, be the first woman to win the Pulitzer Prize for Literature. In June 1915, Wharton visited the battlefields of the Western Front. The previous fall, the Flemish city of Ypres survived a heavy battle when French, Indian, and British troops defended the town against several German offensives threatening the French ports of Dunkirk and Calais. She reported her experiences in Scribner’s Magazine and in Fighting France, from Dunkerque to Belfort. Excerpts of some, below, are edited in World War I and America: Told by the Americans Who Lived It by A. Scott Berg. In June 1915, Wharton’s motor car could barely make it through a steady stream of soldiers of all types—cavalry, mechanics, munitions workers, and others. She could hardly see them for the heavy dust being raised by their movement. Her gift for descriptive writing is evident as she describes the sun creating a “flash of lances” and a small touch of gold on faded uniforms. She next describes the beauty of the environment in an area untouched by the war—farmhouses, duck ponds, beautiful flowers—everything sweet and secluded, including an ancient abbey church. Except for the French architecture, many of the villages reminded her of England. A day later they arrived at an aviation camp spread across a green plateau. The English had hastily made an English town in nearby St. Omer, where the British Red Cross and the ambulance corps were stationed. Soon she was in Cassel, a Renaissance town with the most extensive view of any town in Europe. The square was filled with English army motors and horses. On top of the ‘rock of Cassel’ they could see Dunkerque, Ypres, and other towns, many ruined, through the mist. Later that night, while the town below them slept, Wharton and a small band returned to the rock and could see red flashes and white flares along the fighting lines far away. The next day they rode through territory that was often questionably behind the imaginary German boundary lines. In improvised camps, tents were made from wagon covers, shirts were laid out to dry on elder bushes, and soldiers played with local children or talked to citizens. They came to an empty town with only shells of buildings remaining. Odd, a town with no people. They continued through several similar villages that day. She was disheartened. Had these towns been under an evil shadow, that Germany had willed that these places should die? More than once the next few days, she was unprepared for a bombardment by “big guns” that caused their entourage to change their travel route. They arrived near the Northern Ocean. The contrasts of a standing Gothic church and houses with fronts torn off made a deep impression on her. She felt that the painful sights of human wounds—dangling bedsteads, trashed chairs and stoves—were greater than those of the wounded church. But she was also relieved that the human spirit was still alive. Curious children played at a bomb crater; women bartered for kitchen utensils. In a nearby field, a colonel was holding a medal ceremony. On leaving the battle zones, she again waited for an hour as fresh troops marched past, raising dust, toward the front. After the war, Wharton left Paris and settled in an 18th century manor house near the village of Saint-Brice-sous-Foret, similar to the ones she'd passed through during the war. She died in France in 1937. The difference in writing styles between author Wharton and journalist Nellie Bly, the subject of the last blog post, or reformer Jane Adams (next post) is interesting. Bly’s and Adams’s reports are factual. Wharton brings a literary style to her reports, making her descriptions more vivid and interesting. Researching more on World War I (WWI) the bibliography continues to expand. I just finished A. Scott Berg’s World War I and America: told by the American’s Who Lived It which includes letters, news articles and other written material from the time important to understanding the American culture and mind set concerning the war in Europe beginning in 1914. In the early years, we were still divided over whether to engage in the war. By the end of the book in 1921, President Warren G. Harding is commenting during the burial ceremony for the grave of the Unknown American Soldier. Although the books accounts include few women, those present are impressive. Among them are Nellie Bly, Edith Wharton, Jane Addams and Willa Cather. All had experiences or opinions on The Great War. Elizabeth Cochrane Seaman worked as a reporter for the New York World in the 1880’s using the pseudonym Nellie Bly. She famously traveled the world in seventy-two days and exposed the Blackwell Island Asylum by posing as a patient. In spring 1914 she was traveling in Austria to raise funds for a business inherited from her husband. For a reporter, it was a case of being unexpectedly in the right place at the right time. On June 28, 1914 Austrian archduke, Franz Ferdinand and his wife were assassinated by Bosnian revolutionary, Gavrilo Princip. From fall 1914 until early 1915 Bly would deliver twenty-one dispatches as a Special Correspondent for the New York Evening Journal from Przemysl, Austrian Galicia, in what is now Poland, and from field hospitals in Budapest. Like others reporting at the time, what she saw led her to question the sacrifices made in wartime. Many read these accounts which led to anti-war sentiment in the states which probably helped President Wilson delay his decision to engage in the war. Bly reported from a field hospital that she saw one man with jaws broken in thirty-two pieces by a shrapnel, hanging shapeless on his chest. He’d been in a trench in pouring rain for six days after being wounded with no food or aid. All they could do was try to attach the jaw to his face with a silver wire. When she reached a military hospital in Budapest, she found ten languages being spoken and nurses from five countries. Patients near death were moved to soundproof rooms to ease the anxiety of fellow patients. One day a doctor called her to the hospital. He wanted her to see the “worst case I have ever seen.” The man had lost one foot at the ankle and the other half way to the knee. The Russian had been wounded by a shot through his body. After eight days in a trench, his feet had frozen. His feet dropped off while he was being transported on a freight train and he was bleeding from open veins when he reached the hospital. Ann Otto writes fiction based on factual as well as oral history. Her debut novel, Yours in a Hurry, about Ohio siblings relocating to California in the 1910’s, is available on-line at Amazon, Barnes & Noble, Kindle, and at locations listed on her website at www.ann-otto.com. Ann’s academic background is in history, English, and behavioral science, and she has published in academic and professional journals. She enjoys speaking with groups about all things history, writing, and the events, locations, and characters from Yours in a Hurry. She is currently working on her next novel about Ohio’s Appalachia in the 1920’s, and preparing for future works by blogging about a recent World War 2 European tour. She can be reached through the website, or on Facebook @Annottoauthor or www.Goodreads.com. 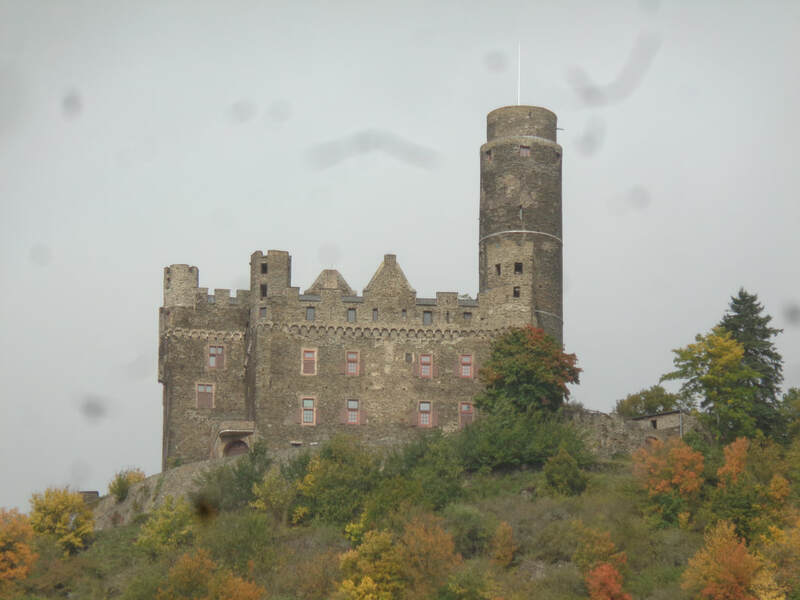 ​We wake to a gray downpour, but as our bus nears Germany and the Rhine Valley, the moisture turns to mist. It’s the last day of the World War 2 Memorial Tour. David and I were previously in this area on a German River Cruise, and we are glad to revisit some of our favorite places. Driving through the Rhine River Valley we stop often for views. Wide expanses of river are bordered by green hillsides, vineyards, and castle ruins. Last year we traveled this part of the river at night, so seeing the ruins so well is a treat. We see more of these on a leisurely afternoon river cruise, a perfect ending for our trip. David’s father often mentioned Remagen Bridge. Visiting it on shore is interesting. The bridge is gone, but the black structure, looking like an old castle, stands—a reminder of what our troops saw. Cargo ships pass by. The surprise capture of a bridge across the Rhine on March 7, 1945 was front-page news in American newspapers. The battle for control of the Ludendorff Bridge at Remagen caused both sides to employ new weapons and tactics. The Germans used virtually every weapon at their disposal to try to destroy the bridge, including infantry and armor, howitzers, mortars, floating mines, mined boats, a railroad gun, and giant super-heavy mortars. To protect the bridge against aircraft, the Americans positioned the largest concentration of anti-aircraft weapons during World War II, leading to "the greatest antiaircraft artillery battles in American history." The German offensive failed. Our last night is in Rudesheim, a favorite stop our previous trip. This time, instead of a short afternoon visit off the boat, we have an entire afternoon and evening at our hotel in the center of the village. The many side alleys lead to restaurants, cafes, and a variety of shopping. We find excellent German products, and buy unique beer steins and a regional Baden-Wuerttemberg flag for home. David and I both have roots in that region. Our ancestors, that of his paternal grandfather and my maternal grandfather, came to America at the same time during the Palatine troubles in the eighteenth century. ​The farewell dinner is bittersweet. We are all ready to return home, but it has been an unforgettable experience. Franz and Gloria, the German immigrant and his spouse from New York are extending their trip to Northern Germany to visit relatives they haven’t seen for years. We wish them well. Many of us from the tour wait for the same 11:15 a.m. flight at the Frankfurt airport. Some converse, others quietly look around the terminal, read, talk on the phone or nap. David and I begin discussing what needs to be done when we get home. Re-entry into everyday life is always interesting. On the flight home, I started thinking about what we learned from this experience. First, that thirty individuals from diverse sections of the United States of different cultures, beliefs and politics can co-exist well over seventeen days given common interests. This was accomplished in a time of severe political disagreement in our country. Our common interest and respect for history was more important. Most were able to use these experiences to connect with their ancestors in the closest way possible give the distance of time. Also, it was easy for us to be visually overwhelmed by the photos, documentaries, films, museums and architecture of cities little changed since the early and mid-20th century, and many cases, centuries before. All of this speaks to a passion and need for preservation that Europeans appreciate. I hope you all can make such a trip in your lifetime, regardless of what heritage or history you are searching for.